TrepStar CD/DVD/USB Manufacturing | On demand CD/DVD/USB POD production & fulfillment | CD/DVD/USB self publishing & shipping service 2019. 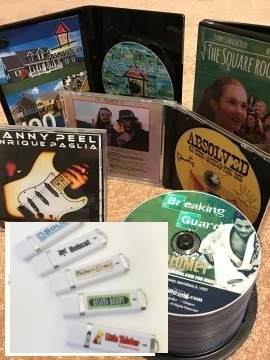 * You have the digital CD/DVD/USB content, and need a service to manufacture, print and ship your CD/DVD/USB in any quantity to anywhere at any time (POD). Publish your content on CD/DVD or USB flash drive. TrepStar Manufactures your product on demand, and ships it to you or your individual customer, in any quantity, at any time. That means zero inventory or up front costs for your CD/DVD or USB thumb drive products. We produce and ship your products only when you order. No Inventory to Warehouse. Pay as you Go. Our loyal publishers rely on us to accurately and consistently produce and ship their digital content on only the highest quality CD/DVD/USB products every day. Get started today with your POD (print on demand) project! * TrepStar provides a free and easy project management system that enables you to publish the CD/DVD/USB yourself. * Support is available to help you set up and configure your project. * We offer high quality, quick turnaround time, and a low price at any quantity. * Call us now at (612) 810-4040. CD/DVD/USB On Demand. Manufactured and shipped to you or your individual customer in any quantity. You've created the content for your CD or DVD or USB. You need your CD/DVD/USB manufactured and shipped when single customer orders come in or, you need dozens or hundreds made right away and shipped to any location. TrepStar manufactures and ships your CD/DVD/USB on demand, at order time, in any quantity, to any address. Our easy to use project management system gives you full control. Create your free project now and finish set up today. Order and we'll ship the next day. TrepStar will manufacture and ship your CD/DVD/USB whenever orders arrive, without any up front investment or commitments. Order just what you need, only when you need it. Our mission is to provide the highest quality service at the lowest price for any quantity ordered. Once your project is configured, our automated system insures your price and our costs are kept low whether you need dozens or hundreds of units at once, or a single quantity sent to an individual customer. Once the project is set up, orders submitted today will ship the next day. Order submission may be automated. We start manufacturing your CD/DVD/USB products on demand at order time. Your single, or multi disc CD/DVD/USB product is then packaged, in any quantity, and shipped the next day. If you ship to individual customers, they receive tracking info, and may even edit the shipping address! Submit single quantity orders when your customer orders from your website using your shopping cart, or the TrepStar cart.